Price includes Wall Size Printed Algorithm Only. Frame and furniture not included. Apx. 24 inches tall x 48 inches wide – Laminated for Dry Erase Markability – Item ships rolled in tubed shipping carton. 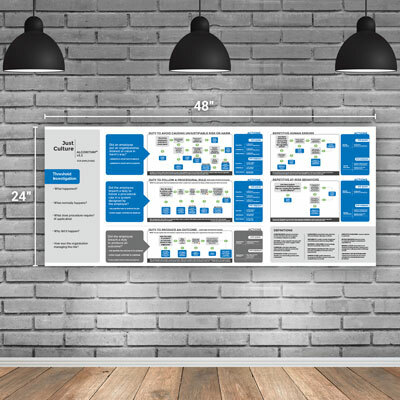 This poster size Just Culture Algorithm™ v3.2 will help to improve group discussions and use of the algorithm in small training rooms. This size can also be posted in a high traffic location where staff will be able to see and better understand the heart of the culture they are working in and contributing to.